The Scorpion EXO-R2000 Ion Helmet (right) is new for Fall and now available for pre-order.This is their most technologically advanced helmet to date, developed in conjunction with Scorpion's sponsored riders in MotoGP. 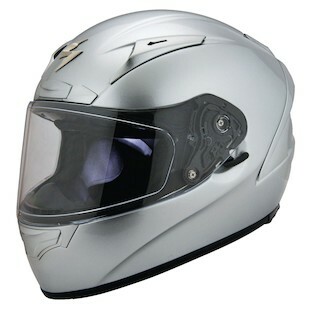 The shell is TCT composite, a proprietary 5 layer blend of fiberglass, Aramid and organic poly-resin fibers.This helmet is optimized for the 3/4 or tucked race position. The moisture wicking helmet liner and cheek pads are removable and washable and accomodate common styles of eyeglasses.Other features are the Everclear no-fog faceshield that is a state-of-the-art fog free and anti-scratch shield. The AirFit pump system allows you to customize the fit in the cheek pads. The new features on the EXO-R2000 are the 4 shell shapes and materials plus a titanium double-d ring for weight savings.The Elip-Tec Ratchet System is also new allowing easy, secure, tool-less faceshield changes. 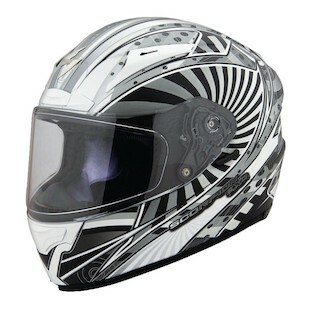 An awesome venting system, there are six intake air ports at the front of the helmet while 10 vents exhaust hot air. Snell 2010 certified in three versions including the EXO-R2000 Circuit graphic (left). 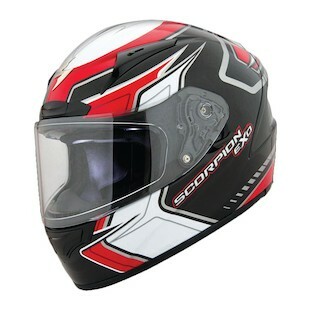 The helmet is also available in solids, Scorpion EXO-R2000 Helmet-Solids. With an all encompassing fit, it has many of the tried and true features known to Scorpion. The new elements are ones that bring weight savings, better fit and comfort plus improved ventilation.